So why is reframing such a core skill for every practitioner? Every practitioner needs to help their clients change how they think. But more than that, our clients need to change how they feel. And there is no quicker way to unlock a strongly-held belief than a well-crafted, carefully delivered reframe. But we all know that's easier said than done. Connect with the client's current reality (rather than the practitioner's!). Be delivered at the right time (this is such an important factor, but rarely discussed). Present a new reality that is just as acceptable, but makes them feel good instead of bad. Present a new reality that is so much more compelling than the old, more restricted way of perceiving their reality. Change the way the client feels, not just the way they think. This is a subtle point that is often missed when so called "cognitive reframing" is used. We've all attempted reframes and had them fall flat. It's a gut-wrenching moment as you realise you've made it harder to get a therapeutic gain because you've raised your client's unconscious defences. But then you know that beautiful moment when a reframe 'sticks'. Your client stops in their tracks, becomes silent, they take on that thousand-yard stare, then they 'come back to the room', often with a chuckle or shaking their head. Their reality has been permanently shifted. But the question is, how to make your hit rate with reframes much more reliable? How to develop an intuition for what reframe will work, when to deliver it, and how? The Conversational Reframing course will imbue your mind with a whole new way of seeing reframing with dozens of examples, a new way of seeing reframes, interactive exercises in how to construct them, video and audio. 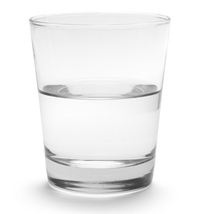 Almost by osmosis, you'll become a better reframer. In addition to the many reframe examples, stories and metaphors in the course, perhaps an even greater benefit will be how it helps you creatively, spontaneously and instantly produce the right reframe for the right, unique person just at the right time. And it's not just your clients who will notice. Artful reframes are evidence of the ability to hold multiple contexts in the mind at one time, perhaps the most obvious sign of wisdom. When you're skilful with reframes, you can make everyone around you feel better without them necessarily knowing why. (And without looking like the 'positivity police'!). Here's a quick summary of what Conversational Reframing contains. The whole course is geared to quickly improving your reframing skills. Dozens of reframe examples which seed your mind with patterns and approaches to make you into a flexibly-minded reframing artist. 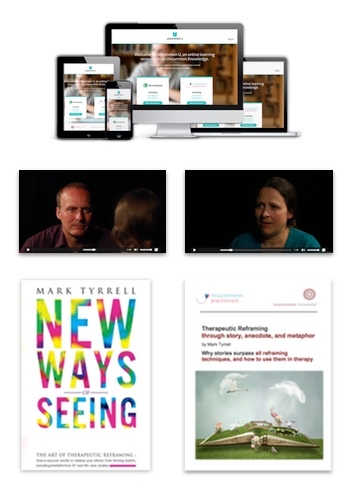 Reframing through Stories and Metaphor eBook /Audio Provided in both written and audio format, Mark originally set out to create a short document on this topic. However, it turned into an comprehensive 39 page eBook with lots of examples of using stories to reframe, and a lot more besides! Certificate of completion. On successful completion of the course you will receive a personalized certificate and confirmation of 9 CPD/CEU hours or points earned. You access the course and get the book by clicking the 'Enrol Now' button. Your log in details will be emailed to you immediately. Once you've got your log in details, you can access all the course materials straight away, including a welcome video from Mark. Read, watch and/or listen to all the course materials and complete the exercises. As you go along, ask any questions you have in the comments boxes you'll find on most pages. Complete the test at the end and get a personalised completion Certificate and confirmation of 9 CPD/CEU hours or points earned. Continue to have access to the course for one year. Let the course its magic on you and in turn your clients! We trained people face-to-face for a decade while we ran our diploma course at Brighton University, in the south of England. When we moved our training online in 2008 in order to reach a worldwide audience, we were a little sceptical. We assumed people wouldn't learn so well online; that live training had to be more effective than online training. But, as it turns out, we were wrong. In traditional face-to-face training, you see the demonstrations only once and hear the presentations only once. And, inevitably, when you go away and try to implement your new skills, questions come up. But, of course, the training has finished, so you can't ask them. With an online course, you can try things out, then come back to the group to ask any questions you have, review the relevant part of the training, and then go back and give it another shot. We've found people who learn online learn more deeply and thoroughly, which is why we now train people internationally. The process of learning, trying something out, then coming back with questions and reflections seems to work incredibly well when learning new therapy skills. A lot of the people who take our courses are not very tech-savvy (therapists don't seem to be computer people, in our experience!). That's why the team here at Uncommon Knowledge has designed the online training platform to be as easy to use as possible. So if you can use a mouse, use your email, and type, you'll be able to do this course. In addition, your course leader Mark Tyrrell is a self-confessed technophobe and so Uncommon U has been created with him in mind. We also have a friendly support team on hand to help you with any questions you may have. When it comes to teaching hypnosis, we've covered a lot of miles. In the beginning, there was our workshop 'How to Use Hypnosis to Help Yourself and Others', which we taught to over 2,000 people over 15 years or so. Then came our hypnotherapy diploma course and accredited UK course, which trained hundreds of hypnotherapists who are still practicing around the UK. We've spent a lot of time refining how we teach hypnotherapy and the psychology you need to make it most effective, and we think we have created something quite special in Conversational Reframing. But, of course, you are really the only one who can make that judgment, which is why all our courses are backed by our 90-day money back guarantee. So you can give it a try in confidence that you're protected. We'll do our very best to get back to you within 24 hours and we manage this over 95% of the time. When you submit your query, we'll send you an automatic response confirming that we've got it. If you don't see this email in your inbox, please check your junk or spam folder. I would highly recommend this course to anyone involved with professional change work.